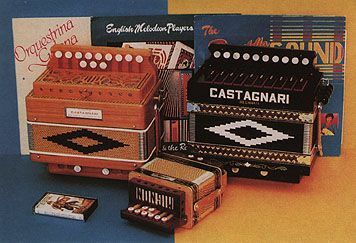 The Castagnari diatonic accordions range is currently (1998) composed of a good thirty models, not including chromatic accordions and, soon, bandonions. Watch out, some of them are completely unknown in France ! Dim : 14 x 8,5 cm - Weight : 600 g ! 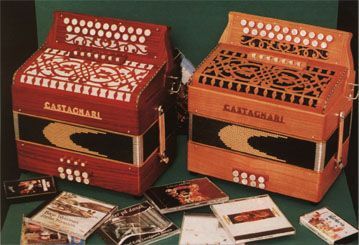 Two "small formats", both with three voices. The three medium voices of the Roma give it a very particular tone. As for the Tommy, it's a very complete and very compact model. 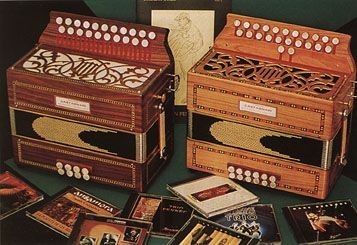 With all voices on, it's practically as brilliant as a melodeon ! Just ask my younger brother ! 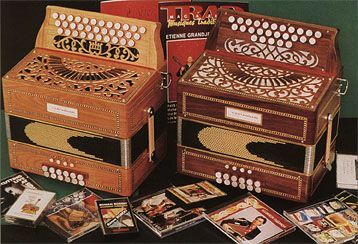 It's also Sharon Shannon's accordion. Korry and Cortina: two extremely beautiful models, very rare in France, where they've no longer been imported for a few years. 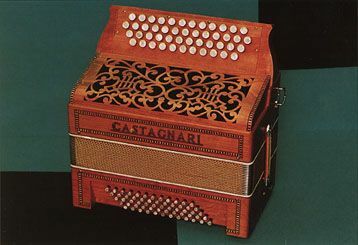 The sculptures which ornate the front of the body contribute to the tone and power of their sound. Don't even think of asking me if I want to sell mine ! Two fairly recent models. 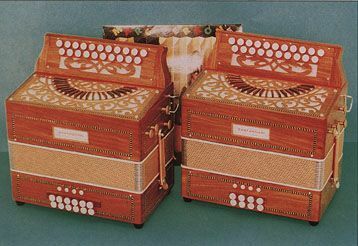 The Wielly is made from an exotic redwood called padouk, which is used only for this model. If I'm not mistaken, it's manufactured mostly for Norway. 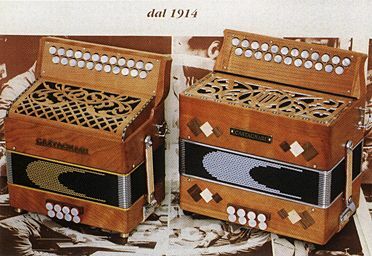 The Montmartre is the same model, only wihtout the bass registers. 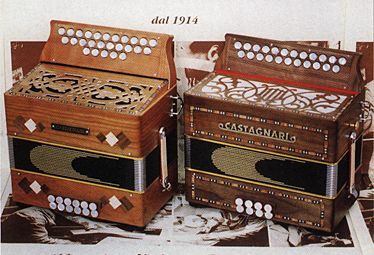 Two variants of a rather special model : the Marc comes equipped with a double cassotto. 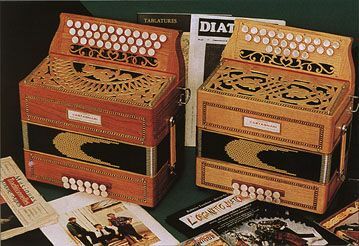 The Trikitixa is a diatonic accordion using the Basque system (23 keys, 4 keys for altered notes, unisonorous bass). For fandango fans... 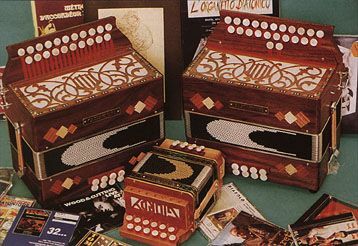 The Benny is a diminutive, lightweight three-row two-voice accordion. 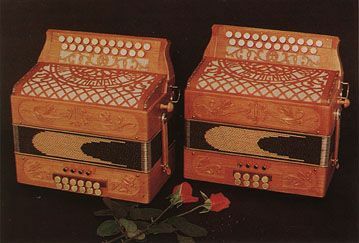 But mark you, it's a true 3-row instrument (33 keys, not 30 or 27) ! 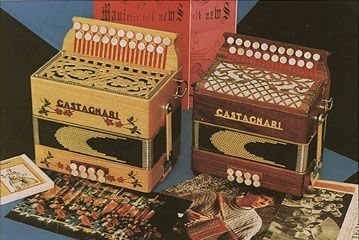 The Matty (not shown here) is the same model with one voice only. 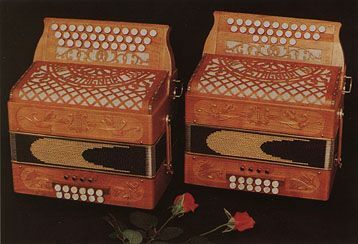 Two more classics : the Mory, and above all the Handry are very complete, but relatively heavy instruments (5 kg). But in spite of this, they remain fairly easy to handle. You see them everywhere, they are sooo commmon... ;-) To tell them from the two-voice Rik and Dony, the simplest is to look at the screen: wedged on the Rik / Dony, if has decorations in relief on the Handry and the Mory. 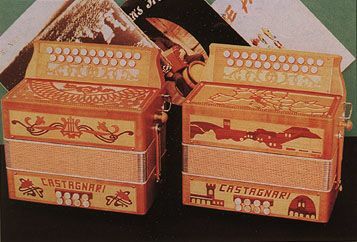 Parent both to the Cortina (for its sculptures) and to the Handry (for its contents), the Jacky has been adopted by renowned accordionists, such as Alain Pennec. 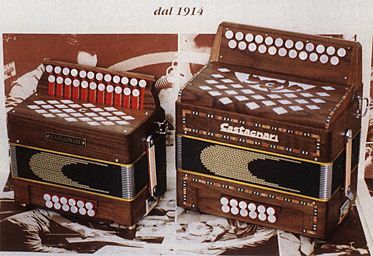 The Sessy is the same model with two and a half rows. 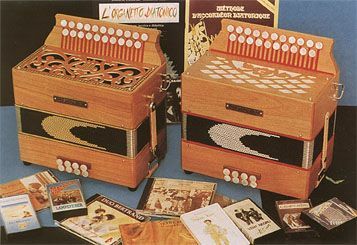 The Rolls-Royce of diatonic accordions: it is the only one able to offer chromatic bass, thanks to it 18 bass buttons. And yet it's not that much heavier than the regulag Handry (5 kg 600). 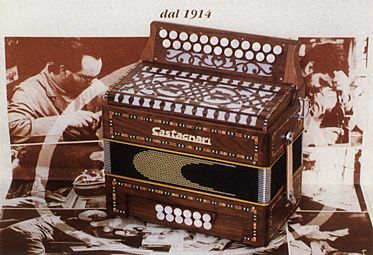 A recent development of the latter, the Handry 18 appears more and more often between the hands of talented musicians : Marc Perrone, Riccardo Tesi, Ronan Robert, Bruno Le Tron... One should also mention the Handry 18 Cassotto, with its resonance box. It is somewhat heavier (6 kg) and bigger than the Handry 18. 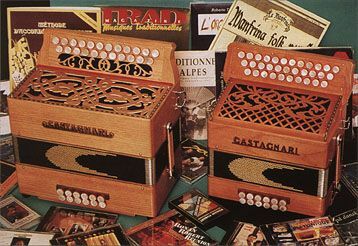 Look, a chromatic accordion who got lost in here... ;-) But after all, it bears an obvious resemblance with the rest of the family, doesn't it ? 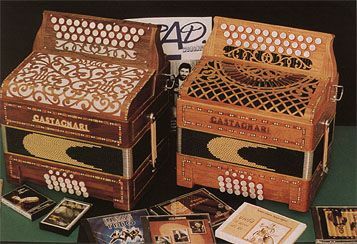 A new range of Basque accordions, with one to four voices (reeds), starting to replace the Trikitixa. You can expect to see Joseba Tapia play on one soon! 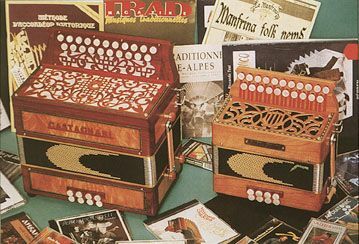 And finally, a range of flat-keyb8oard.Irish accordions. Many many thanks to Mauro for the Italian translation of these pages !